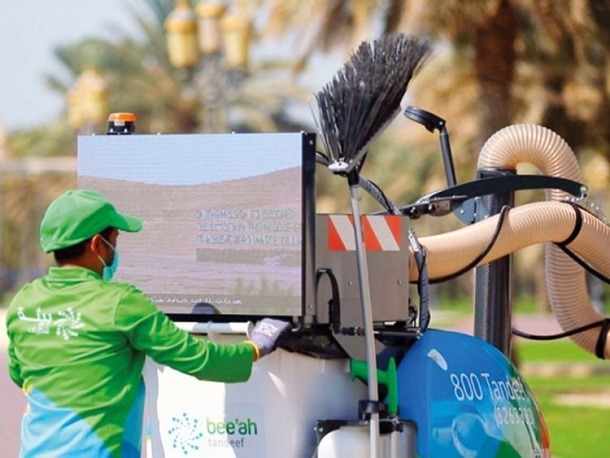 Tandeef, the city cleaning arm of environmental management company Bee’ah, has introduced autonomous litter vacuum cleaners that can be trained to recognise their operator. The intelligent machine will then automatically follow behind its operator allowing him or her to carry out manual cleaning tasks uninterrupted. Tandeef operates street sweeping, cleaning and waste management services in several regions of the UAE including Dubai, Abu Dhabi and Sharjah. Situated on the Arabian Gulf, Sharjah is widely considered to be the nation’s cultural capital. The company has also introduced an advanced fleet of eco-friendly vehicles, automated route optimisation and geo-tagged smart bin sensors. These solar-powered smart bins act as Wi-Fi hotspots and are directly linked to Bee’ah’s control room for efficient waste collection. Bee’ah operates 1,200 vehicles and the introduction of autonomous cleaners is part of the company’s plans to expand its next-generation fleet. The collected waste is processed at the Bee’ah Waste Management Centre at Al Saj’ah and reintegrated into the economy. And Bee’ah claimed to be the first company in the Middle East to place an order for Tesla’s electric battery-powered Semi trucks.